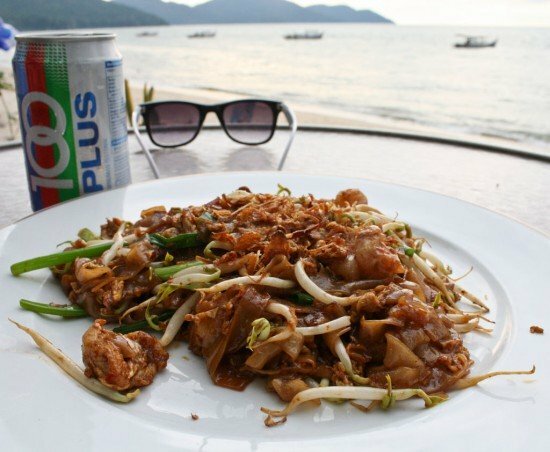 Penang hawkers are famous for their version of Char Kway Teow, rice noodles stir-fried with dark soy sauce, seafood, fish cake, eggs, bean sprouts, chives, and sometimes chili or shrimp paste. This dish reminded me of Pad See Ew, but with a richer flavor (probably from the shrimp paste) and a little more spice. Char kway teow has a reputation for being unhealthy since it’s traditionally fried in pork fat, but now vegetable oil is also common. In the background is Penang’s Batu Ferringhi beach, and a can of 100plus. 100plus is a lightly sweet, carbonated soda designed to replenish electrolytes and prevent dehydration. In Malaysia it’s used as a remedy for fever, headaches, and even dengue fever!